As days become cooler and nighttime temperatures begin to drop, people are not the only things that begin to perk up. Plants love these changes too! The summer monsoon rains along with the cooler temperatures encourage new growth on trees and shrubs. Not only do we feel like spending more time outdoors, but the conditions are also perfect for Fall gardening tasks. The list below provides great ideas for brightening up your garden, growing tasty things to eat, and planning ahead for the Winter and the Spring beyond. 1. Brighten your yard with fall and winter color. Whether you plant them in the ground or in containers, here are some annuals that will now and throughout the winter: alyssum, chrysanthemums, dianthus, lobelia, petunias, snapdragon, stock and violas. 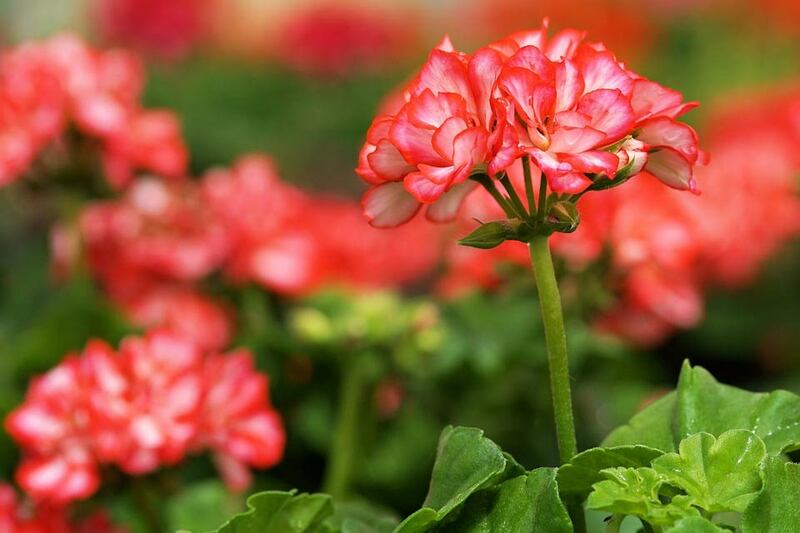 As it continues to cool down, you can also plant geraniums (will need to be protected against a hard freeze), pansies and primrose. 2. Create a kitchen garden for fresh herbs for your meals. October is an excellent time to plant cool whether herbs such as chives, dill, fennel, mustard, oregano, parsley, rosemary and sage. Like the flowering annuals, herbs do well in ground or in containers. Make sure you plant them right outside your kitchen door so that they’re only steps away when you’re in the middle of meal prep! 3. Plant a fall veggie garden for tasty, nutritious food. Now is the time to plant cool weather vegetables. Most can be grown from seed and many are available as plants at local nurseries. Fall-winter vegetables include: greens such as lettuce and spinach, cruciferous vegetables like broccoli and cauliflower, and legumes such as fava, garbanzo and lentils. See chart below. Fall/Winter Veggies: Artichoke Cabbage/Chinese Cabbage Fava & Garbanzo Beans Parsley Arugula Carrot Fennel Peas Asian Greens Cauliflower Garlic/Shallots Radish Beets Celery Kale Rutabaga Bok Choy Chia (also wildflower) Kohlrabi Scallions Broccoli Cilantro Leaf Lettuce Spinach Broccoli Raab Collard Greens Lentils Swiss Chard Brussel Sprouts Dill Leeks Tomato (start seeds) Bunching Onions Endive Mustard Greens Turnips NOTE: Annuals and veggies require a rich soil with high fertility. Always best to add new soil/compost with each new planting season. Consider incorporating some slow release fertilizer into the soil at time of planting. 4. Plant wildflower seeds now for great spring color. When pumpkins begin appearing in the grocery stores, it’s time to start planting spring wildflowers. Wonderful mixes of native wildflowers can be found at many nurseries at this time of year. Or buy packets of your favorite flowers and make your own mix. Chia (the seeds are also eaten and appreciated as a health food), desert blue bells, desert and arroyo lupine, gaillardia, Mexican gold poppies, owl’s clover, and penstemon are all good choices for planting now. The seeds can be scatter in gravel, which will make it harder for birds to find and eat. In bare soil, loosen the dirt with a rake and scatter the seeds. Use the flat side of the rake to return a light coating of soil over the seeds. A light layer of straw or small branches can be effective in keeping the birds away from your seeds. Keep the soil moist until the seeds begin to germinate. With a little luck, the winter rains will help you out! 5. Add trees or shrubs to your yard. Trees and shrubs that are not sensitive to frost can be planted in the fall. The winter months give the plant time to develop a good root system, which will prepare it for new spring growth. Winters rains help with this process as well, and allow the plant to become established before it has to endure its first summer. In addition to the beauty they add, trees and shrubs have other benefits as well. Dense trees planted on the west side of a house will shade the house when mature, cutting air conditioning bills. Shrubs can provide a windbreak protecting smaller, more vulnerable plants. And planting in layers—tall trees, shrubs and perennials—add interest to the landscape and offer habitat for birds and other wildlife. NOTE: Avoid planting trees and tall shrubs in front of south-facing windows. This will block the sun that delivers “free” heat during the wintertime. 6. Super charge your spring garden by planting a cover crop now. Plants such as clover, garden peas and legumes planted can be planted now. Cut them down before the go to seed and leave the organic matter behind on the top of the soil. This will break down throughout the winter adding vital nutrients to your garden. 7. Make your container plants happy moving them into the sun. Plants needed shade during the heat of the desert summers. Now, they’ll be happiest if they’re moved into the sun for the duration of the winter. The south side is perfect for container plants because it will get sun all day long. 8. Save water by cutting back on irrigation times and amounts. As temperatures cool, plants need less water. So, this is the time of year to reduce the watering times and amounts. If in doubt about your plants needs, consult with a nursery or landscaping professional. Further, cutting back on irrigation to citrus and grapes encourages them to become dormant. This is turn, helps keep them from producing fruit if there is an warm spell. 9. Do your garden a favor and mulch! Organic mulch is one of the best things you can do for your garden. It reduces evaporation of moisture from the soil by as much as much as 70%. This means you save water by having to water less! Mulch also breaks down and adds organic matter to your soil, improving the soil quality and the health of the plants. Add 3–6 inches of mulch to bare soil around shrubs and trees. Add an additional layer of mulch to existing mulched areas to restore them to a 3–6 inch depth. You’re plants will thank you! October is a wonderful month to be in the garden. Hope you have an amazing time adding your garden awesome!